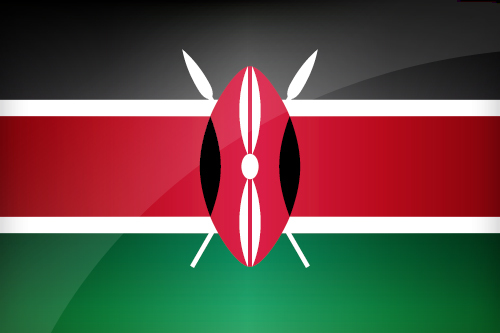 The flag of Kenya was adopted on 12 December 1963. It consists of three horizontal stripes black - red - green, separated by small white stripes, surmounted by a shield-shaped logo. The colors refer to the description of pan-African colors: black for the Kenyan people, red for the blood shed for independence, and green for the very important natural resources of Kenya, including its vast forests. The white stripes were added after Independence symbolizing freedom, while the shield with spears may be reported to the Maasai people, the main tribe in the country. This flag was designed by President Kenyatta. You can download it in different sizes, in a decidedly modern design for your personal use, or for wider use. Kenya's flag is available in 4 different sizes. Keywords: Flag kenya wallpaper, Kenyan, Republic of Kenya, National kenyan flag, banner, pictogram, country, icon, Kenya icon, international, Nairobi, Nairobi, Mombasa, Nakuru, Eldoret, Africa. This page has been viewed 5745 times.